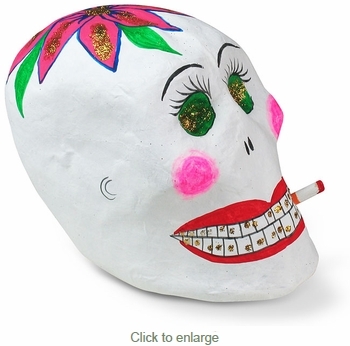 This Mexican smoking skull is made from paper mache and will add a colorful touch to your Day of the Dead decorations. All of our paper mache skulls are handcrafted by folk artists in Mexico. These are individual works of art, expect variations in color and design on these paper mache calaveras (skulls).